WE ALL HAVE good intentions during Christmas. We say we’re going to get our shopping done early this year, yet things happen and before we know it, we’re only a few days to get everything done. If you’ve been unlucky and you haven’t started your shopping yet, there’s still time to get what you need. We covered the main gadgets to get last week, but if they’re out of reach for whatever reason, here are more gift ideas that will help do the trick. The handheld tablet market is dominated by the iPad mini and the Nexus 7 but there are a number of mid-range tablets that are worth getting. Going at a reduced rate at Argos, the 8GB Galaxy Tab 3 is the same size as its counterparts and worth taking a look at. If the small storage space is a cause for concern, you can rely on Dropbox to save any important data. If that doesn’t float your boat, here are some other alternative tablets for you to buy. We’ve spoken about the HTC One before, but it is one of the best Android devices out there. Sleek, well-designed and a great performance means it’s a great high-range smartphone. Both cheap and cheerful, the Lumia 520 offers a lot and puts most mid-range phones to shame. A straightforward device that doesn’t mess around, it’s a great introductory phone for those who mightn’t be as tech savvy. Considering so many of us have a smartphone, getting touchscreen gloves is a handy little gift if you’re buying for someone who has every gadget. It’s more practical than exciting, but hey, they’ll keep your hands warm as you respond to that WhatsApp message. It’s exactly how it sounds. * A cap that has built in speakers so you can listen to your favourite songs while staying warm. They’re also very cheap to buy so they can easily accompany another gift you’re getting. If it’s a store that sells products, then the chances are it also sells smartphone and tablet cases. Finding one isn’t difficult but picking out a good one is. Usually what you pay for is what you get so investing in a case like this one from Gentleman’s hardware is a good idea. If you’re willing to wait a little longer than Christmas for a specialised case, there are a wide range of Irish companies who do things differently. Carve Cases provide wooden covers with custom engravings for your iPhone, while the cases from Kovet boast some amazing artwork. Despite the name, keeping your laptop on your lap isn’t particularly good for you since you’ll be hunch over looking at it. If you know someone who’s regularly glued to their screens, the Milo Bentwood Laptop tray in Argos would be a good one to start off with. You have to have a heart of stone not to get some joy out of playing around with an RC helicopter. Getting one for cheap is pretty easy, and they’re a lot of fun to play around with. If you’re bad at it, you’ll enjoy playing around with it while those who take it seriously will get a lot of satisfaction learning how to fly it properly. 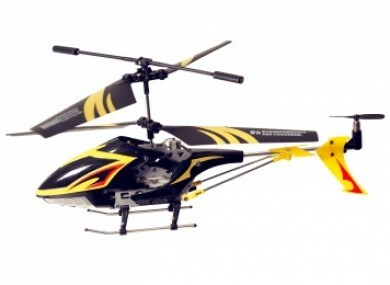 The G-Viator Helicopter is a nice introductory RC helicopter. Each flight can last for six minutes and it takes roughly 20 mins to charge meaning it’s a great toy to dip in and out of. Available on Steam for both Windows and Mac, Gone Home tells the story of your arrival home after a year abroad, but your family isn’t there to greet you. What unfolds is a unique experience where you explore the house, learning about each family member and their lives as you piece together what happened. Gone Home is a game that’s about the journey rather than the destination. There’s no action, enemies or thrills, but it still manages to be a brilliantly crafted story that will stick in your mind long after playing it. The game is being offered for a reduced price during the holidays (until 2nd January) so you’ve no excuse not to get it. Another game on Steam, Hotline Miami’s pixelated art style disguises what is a gritty top-down shooter that is very much for older players. It’s fast, frantic and can be frustrating, but it rarely feels unfair and you’ll keep playing even after you’ve died for the hundred time. Like Gone Home, Hotline Miami is being offered for a reduced price on Steam until 2nd January. Not all presents have to be physical as you can easily get digital gifts too. All the major online stores such as Amazon, Apple, Google, and Steam allow you to purchase apps and email them to friends as gifts, while Netflix (€6.99 to €83.88) and Spotify (€9.99 to €119.88) allow you to buy gift subscriptions for up to 12 months. Handy to keep in mind should you be out of ideas. Email “The last-minute gadget gift guide”. Feedback on “The last-minute gadget gift guide”.